Toronto’s waterfront continues to see a retail transformation that has been ongoing for the past several years. It’s all about creating a sense of place, according to those involved, with the necessity to future-proof new developments. 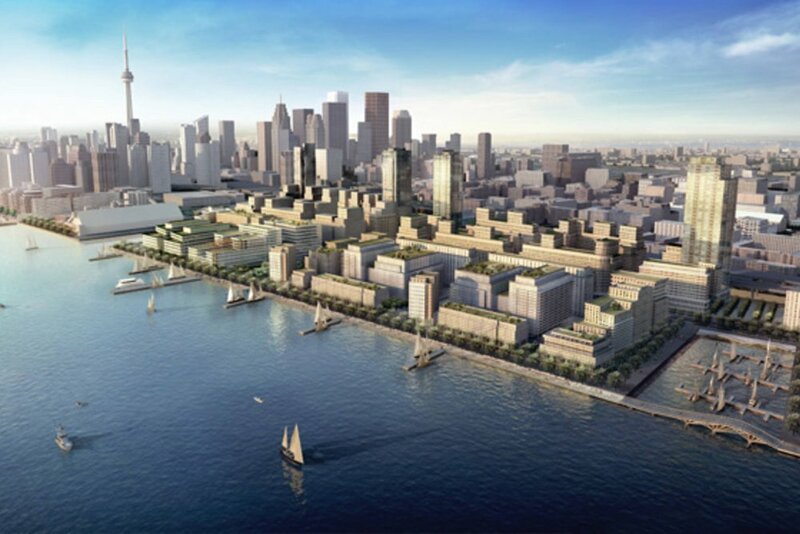 The future looks bright with the announcement that developers including Sidewalk Labs will be involved with substantial development on the eastern waterfront. The city’s Harbourfront area between Bathurst and Yonge Street had been an industrial area for decades prior to the 1980’s, when developers began building multi-use projects to bring people down to the waterfront. Queen’s Quay Terminal was one of the first projects to change the area — the massive 10-storey, 750,000 square foot circa 1926 building was converted from a warehouse to a condominium and retail complex in 1983. Developers added other retail to the area as residential towers were added — since the 1980’s, thousands of people have moved into the area, and many more are on the way as Toronto sees an unprecedented building boom in its downtown core unlike anything on the continent. Despite the population explosion, the waterfront hasn’t lived up to its reputation aesthetically, nor has a mix of compelling retailers been added to create a shopping destination. All of that is about to change, both east and west of Yonge Street along the waterfront. Rob Spanier, Partner and Principal at Toronto-based consultancy LiveWorkLearnPlay, explained how Toronto is increasingly becoming a global focal point and as such, its waterfront is key to an overall urban strategy that lives up to the company’s name. Aesthetically, the city’s western waterfront has seen huge improvements, which include new streets and sidewalks in a substantially improved public realm. Still, he points out, the Toronto waterfront lacks “things to do” — which includes shopping, which many consider to be a pastime. Mr. Spanier can speak to topic — he has more than 14 years experience in mixed use development and deals making, and has helped develop more than 50 large-scale projects around the world. He’s been instrumental in prominent developments such as the 2015 PanAm Games Athletes Village in Toronto, Harmony Village in Barrie and North York, and the downtown revitalizations of Guelph, Mississauga and Vaughan. He sees big opportunity for Toronto’s waterfront, as well. For the Toronto waterfront, LiveWorkLearnPlay partnered with Toronto’s Waterfront Business Improvement Area (WBIA) on a Strategic Framework and Tactical Plan. Over a five month period between February of 2017 and June of 2017, LiveWorkLearnPlay studied the area and came up with an overview assessment from three angles — real estate, planning, and economic development. The resulting report (download PDF here) identifies challenges and opportunities as well as a strategic framework for incorporating and implementing tactics to guide future WBIA initiatives in its role as “the voice of the Waterfront’s business community”. As part of an overall retail strategy, creating experiential places that people can enjoy will be key, Mr. Spanier explained — its long-term success will depend on creating a “city destination”. LiveWorkLearnPlay was instrumental in the development of Toronto’s Canary District, located to the east of the Distillery District, for example, where smaller, independent retailers were curated to create a neighbourhood experience that speaks to place-making. Mr. Spanier explained how much of the retail space on the north side of Queen’s Quay was built as something of an afterthought by developers selling condos — including low ceilings and poor visibility, it’s a wonder some spaces have been leased at all. Smart developers are creating retail spaces with higher ceilings and overall better usability and in some instances, it’s purpose-built with a tenant in mind. Retail is inevitably a component of city building in the modern world — it’s often what we see when walking down urban streets. Other cities are creating spectacular waterfronts and if Toronto wants to compete, it will have to up its game in terms of overall experiences on the downtown lakefront. Accessibility is an issue in some instances — Mr. Spanier noted that despite efforts to increase noth-south access between the Financial District and the waterfront, there’s still work to be done. The streetscape under the Gardiner Expressway remains harsh, walking lights are a challenge, and walking under it can be unpleasant — and once one is at the waterfront, there’s limited retail beyond a handful of restaurants and small grocery stores. Crowds of tourists visit and when they get there, some are disappointed. The question to ask is: Is Toronto a waterfront city, or merely a city on the water? Things are certainly changing, — proposed developments between Yonge Street and Jarvis Street along the waterfront will add thousands more new residents in towers that will approach 100 storeys in height — and ample retail will be included to service those living and working in the area. As well, Sidewalk Labs, the urban innovation arm of Alphabet Inc. (formerly Google) will be instrumental in being involved with the redevelopment of much of the vacant port lands located east of Sherbourne Street, while also relocating Google’s Canadian headquarters to a site just south of the Distillery District in a new area called Quayside. David Ian Gray, consultant and retail strategist/founder of DIG360, explained how Sidewalk Labs’ Toronto development could revolutionize retail as a whole, while also acting as a test base for new concept and ideas. Retail is changing — omnichannel isn’t a new buzzword, though there’s a blurring of in-store and online unlike anything in history. “Much of the fresh thinking is being imposed on traditional retail by outsiders such as Google and Amazon. It will be interesting to see how Google will rethink physical retail development”. Pop-up retail is more popular than ever, as well, and Mr. Gray recently went on record saying that he predicts 2018 to be ‘The year of the pop-up’ — though given what we’ve seen lately, we might already be there. ‘Future-proofing’ new retail developments is important and Mr. Gray should know — his firm, DIG360, is involved in transformative subjects, including a number of urban renewal projects anticipating relevance for retail in two, five, ten, and even 25 years down the road. He notes that it’s important to keep an open mind and to design retail spaces with flexibility if planning for the unknown — high ceilings, convenient access and overall flexibility will be key for a retail space that might see different uses over its lifetime. Ultimately, designing pleasing retail environments is what will get customers to come — not to mention stay and spend. That includes not only making retail space itself desirable for tenants, but also making the overall experience as painless as possible, from getting to the store to exiting it. Global cities are stepping up to the plate by creating pleasing public realms that also attract shoppers — cities such as Barcelona and Vancouver have invested in their public realms with considerably better results than Toronto, which struggles with its appearance. While the future of Toronto’s eastern waterfront is full of promise, some of Toronto’s elected officials could get in the way. It’s already happening — in June of 2015, Toronto City Council voted to replace the elevated Gardiner Expressway with a newly built structure that will continue to impede access between the core and the waterfront, both physically as well as psychologically. This, at a time when other global cities are demolishing similar infrastructure with success. Mayor John Tory supported a vote to maintain the minimally-used stretch of elevated freeway, as did several city councillors who appear to be more concerned with appeasing suburban constituents than supporting logical urban infrastructure investments. Despite its politicians, Toronto’s future is bright — brilliant minds are coming together to strategize and create gathering places that will be compelling, and retail will play a critical role in its success. With a strong vision towards the future that includes place-making, Toronto’s waterfront has the potential to be a retail draw for the city, not to mention globally — welcoming communities could be created that are great places to live, work, learn and play. Future-proofing these developments will be key to their success and ultimately, Toronto’s waterfront could become a global leader.